No risk obligation free fully featured 30 day trial. With Statistician, import and storage of data is so easy you'll never want to go back. Statistician is a powerful Excel statistics addin for Microsoft Excel 2007 or later. Statistician is a comprehensive yet simple to use add-in for Microsoft Excel 2007 or later. The software performs high quality statistical analysis based on series of easy to use forms, activated via the Excel ribbon. Statistician works in a unique way when compared to other Excel based statistical analysis software. Most importantly, it allows the user to store a data set and perform multiple analyses on it, a method used by all high end statistical software, but lacking in many other Excel add-ins which require the user to reselect data over and over again when they return to the spreadsheet. Many customers, having used alternative statistical data analysis products in the past, are amazed by not only how powerful and reliable Statistician is, but how quick and easy it is to use. After downloading and installing Statistician you can use the software for 30 days without obligation. After 30 days Statistician is available for ongoing use at one low price of $US19.95 (per computer). No annual licenses are required. It is ideal for individuals, businesses, academics, students, universities and government. Comprehensive documentation & sample data is also included and full support is available to paid users. Includes OLS, White and Newey West standard errors. Also reports Variance Inflation factors and Mallows Cp analysis. Includes One Sample (F test), Two Sample (F test), Bartlett Test and Levene Test (inc Mean, Median and trimmed Mean). Includes the Jacque-Bera test, Anderson-Darling test, Shapiro-Wilk test, Kolmogorov-Smirnov test, Lilliefors test and the Cramér-von Mises test. Tests include Runs, Mann Whitney, Wilcoxon Rank Sum, Wilcoxon Signed Rank Sum, Sign, Kolmogorov Smirnov (two sample), Kruskal Wallis, Friedman, Chi square goodness-of-fit and Kolmogorov Smirnov goodness-of-fit. Includes Multinomial Experiments and Contingency Tables. Includes both the Logit Model and Probit Model. Includes Pearson, Spearman, Kendall tau (a & b). Includes Autocorrelation Function, Partial Autocorrelation Function, Box-Pierce (1970) test statistic, Ljung-Box (1979) test statistic. Includes over 20 statistical tables that can be printed directly to an Excel worksheet. Rank Data Variables in both ascending and descending order, including rank of each observation in the Data Variable and reporting the “tied” rank of each observation and the percentile of each observation. Generate random samples from a Data Variables with replacement or without replacement. Minimise or maximise that value in one cell by varying the contents of other cells in an Excel worksheet. Creates lagged Data Variables of any order from pre-defined Data Variables. Tests if a Data Variable is equal to, greater than or less than a given value. Choose between known and unknown standard deviation (z & t statistics). Output includes a confidence interval for the mean and the sample size required for a given confidence interval. Tests if the difference between two Data Variables is equal to, greater than or less than a given value. Choose between known and unknown standard deviations. Choose between equal and unequal standard deviations. Output includes a confidence interval for the mean and the sample size required for a given confidence interval. Tests if a Data Variable is equal to, greater than or less than a given value. Output includes a confidence interval for the mean and the sample size required for a given confidence interval. Tests if a population proportion is equal to, greater than or less than a given value. Output includes a confidence interval for the proportion and the sample size required for a given confidence interval. Tests if the difference in proportions between two Data Variables is equal to, greater than or less than a given value. Output includes a confidence interval for the difference in proportions and the sample size required for a given confidence interval. After installing Statistician, users will find a new ribbon in Excel. All analysis is conducted from the Statistician ribbon. 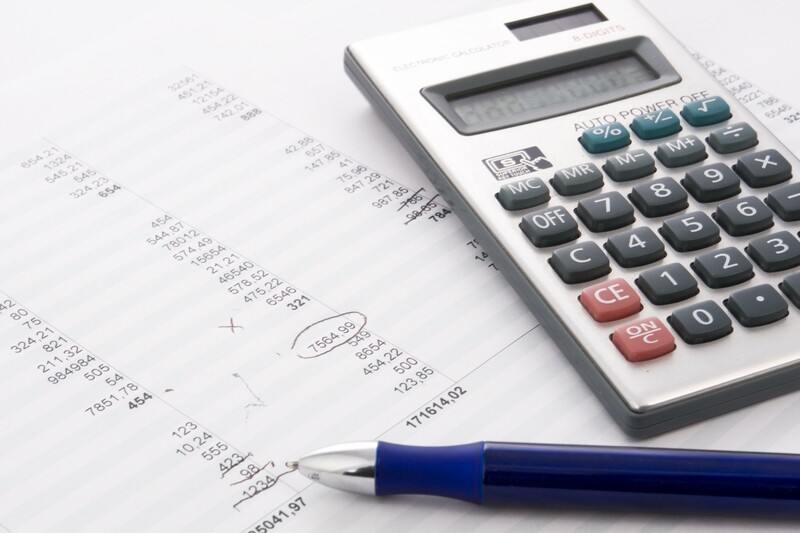 All statistical analysis in Statistician is conducted upon Data Variables. A Data Variable in Statistician is a series of numbers or text that is initially stored in a column in an Excel worksheet. Data Variables can be defined, removed, exported and renamed from the Manage Data form. To perform statistical analysis upon any Data Variables the user selects a command from the Statistician ribbon. 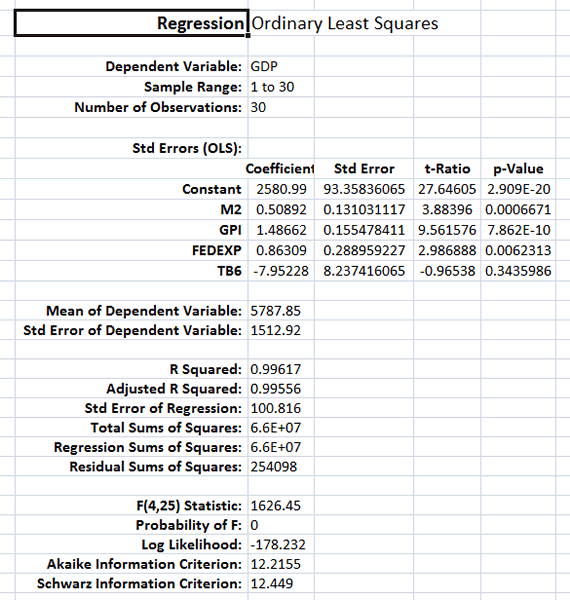 For example, if a user wishes to perform a linear regression the ‘Regression’ button is clicked and the following form is presented to the user. 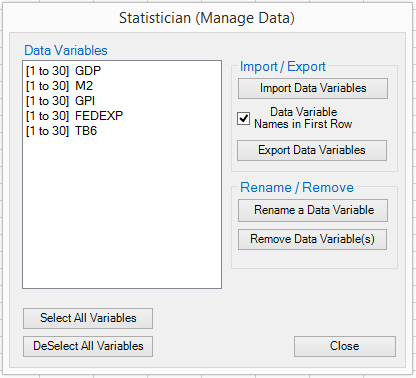 The user can then select the dependent Data Variable and the independent Data Variables. Output is sent to a selected location in a worksheet when the ‘Output Results’ button is clicked. Output to a worksheet is set out in a readable user friendly form to the user. Microsoft Excel is the industry standard software tool for data analysis. Most people involved in the analysis of data are familiar with Excel. Microsoft Excel also has many powerful presentation features including the graphical presentation of data. The standard MS Excel system is far too limited in it’s capabilities to be considered a true statistical package. Consequently most of those involved in more demanding numerical data analysis problems in business, government or academia often use other software packages such as SPSS, Stata and SAS. What's wrong with most statistical packages? They are often hard to use. The input and output is often cryptic and difficult to interpret. They do not immediately integrate into Excel. This lack of integration is a problem because most data used in professional statistical packages is originally sourced from an Excel worksheet. Build a statistical package directly into MS Excel. Have been too limited in their capabilities. Input and Output from these addins is often difficult to interpret. Have often been created using VBA (Visual Basic for Applications).  This programming language is slow, and inadequate for more demanding numerical tasks. Because of these and other issues, in early 2008 Microsoft announced that it would discontinue support for VBA. So what's different about Statistician? Statistician has been developed with Microsoft Visual Studio. This development environment is Microsoft’s flagship development tool for Microsoft Office applications. It is also a part of the .NET framework, Microsoft’s standard for PC based solutions running under Windows. It offers high levels of web security and the ability to automatically update software without end user intervention. Microsoft Visual Studio is a flexible and very powerful development environment that produces fast and robust compiled code. It is the ideal environment to develop a statistical package within Excel. Statistician has been developed within the following design philosophy. It must be completely integrated into Excel. It must have meaningful, well documented input and output. It must be cost competitive with other competing statistical software packages. 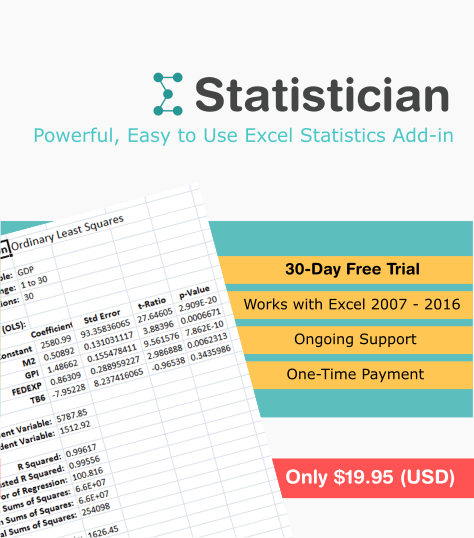 Statistician offers users the ability to perform high quality statistical analysis of data through a number of easy to use and intuitive forms activated from the Excel ribbon. Statistician is not just another handy collection of additional Excel functions. Rather, Statistician works like a professional statistical package with its ability to define, store and analyze Data Variables. Click below for a fully functional 30 day trial of Statistician. After the thirty day trial period expires, you must purchase a license to continue using Statistician. Please note Statistician will only run on the Microsoft Windows operating system. It will not run on Mac OS. For comprehensive instructions on the use and capabilities of Statistician you can download the Statistician User Manual. To quickly learn how to use Statistician you can download the Quickstart Guide and Quickstart Data (an Excel workbook).